Due to my passion for boxing beginning in mid 1966 as a six year old, I was fortunate to see the entire career of former heavyweight champions Joe Frazier and Larry Holmes. Due to their style contrast, Frazier (1968-71) versus Holmes (1979-82) is one of the more fascinating bouts to ponder the outcome. In the ring their approach to fighting and boxing couldn't be more opposite. Holmes was a boxing stylist and was at his best fighting outside while utilizing the ring as opposed to Frazier, who was a swarmer and pressured his opponent trying to shrink it. No doubt if Holmes had his choice, he'd like the infield of Yankee Stadium roped off as the ring if he were fighting Frazier. Given the same choice, Frazier would've chosen the Dome-Of-Silence that agent-86 used to confer with the Chief in "Get Smart," for the ring. In 1974, they did share the same ring when Holmes worked with Frazier to help him prepare for his rematch with Muhammad Ali. When discussing how a Frazier-Holmes bout would've turned out, most of the boxing people whose opinion I value believe Holmes held the stylistic advantage, something I totally disagree with. If you watched Frazier closely and fully understand what he was doing when he fought, there's only one conclusion. No other heavyweight understood how to fight boxers and movers better than Joe did. He didn't allow them to move or use the ring. His style forced the boxer to rush his punches trying to fight him off instead of allowing him to box. Nothing troubles a boxer like unrelenting pressure, and Joe Frazier had no equal when it came to applying it. There aren't many heavyweight greats Larry Holmes doesn't match up with from a style vantage point. The name heading the short list of those who would've been a problem for him is Joe Frazier. Frazier had the perfect style and mind set to be a nightmare for Holmes. Frazier's short stature, standing just over 5'11" would've worked to his advantage. In 23 title bouts between 1978-86, Holmes fought one fighter under six feet, Ossie Ocasio, who only had 13 fights at the time. Joe's style of coming in low would make it harder for Holmes to find him with his jab than most realize. Larry didn't like to punch down; he'd prefer tall fighters like Bonecrusher Smith or Gerry Cooney. They provided a big target without much head movement while they pursued him at a pace in which he could pick his spots and score almost at will. Forced to punch down at Frazier would've reduced Holmes accuracy. If his jab wasn't finding the target with it's normal regularity, he'd be more measured coming over with the right hand, thus reducing both punches as a weapon. Once Holmes sensed Frazier was making him miss with the jab more than it was just him being a little off with it, he wouldn't throw it with the same impunity. This translates into less resistance for Frazier to get to where he needs to be fighting Holmes, inside. Holmes never faced an opponent who was an exceptional body puncher or one that applied constant pressure. Check his record, such a fighter doesn't exist. Gerry Cooney could rip to the body, but he was too big to get under Holmes jab to get to it. Ken Norton was 34 and on the decline when he fought Holmes, yet still gave him the toughest fight of his career. He's also the only fighter who pressed Holmes with any regularity, but he was 6'3" and leaned back more than he got low. Even a prime Norton didn't bring nearly the same heat as Frazier, nor was he the puncher to the head or body. Joe Frazier was the best heavyweight I ever saw pressure an opponent while cutting off the ring and staying in front of him as he got closer, something that is missed by so many, and would play a huge role had they fought. The only fighter Larry met who really attempted to cut off the ring on him was Leon Spinks. If you think Holmes would've beat Frazier, maybe you'd point to his stoppage of Spinks. Even that's a slippery slope because Leon was taking it to Holmes pretty good until he got careless and rushed in recklessly wide open for Holmes right hand. If there was one thing Frazier could do in his sleep as a fighter, it was shut down a boxer. He never led to the head and always started to the body and worked his way up. His right to the chin wasn't anything special, but it was when he threw it to the body, and Holmes had plenty of body. Frazier was a debilitating body puncher and wouldn't need 10 rounds to wear Holmes down. The first time Joe had Larry cornered and unloaded on either side of his body with left and right hooks, it would slowly become a more frequent pattern as the fight progressed. Holmes left jab kept most of his opponents from getting to his body. How good he really took it downstairs is something no one really knows since he never really had to. Frazier would've pressured Holmes every minute of every round for 15 rounds if necessary. Larry couldn't fight him off too many rounds before he'd need to come up for air. When he stopped to try and catch a breather, Frazier would've had him right where he wanted. For Holmes to keep from having his body beat on by Frazier, he'd have to keep moving. Either way, Frazier's forcing him to expend his strength and stamina which would pay dividends for him later in the fight. Eventually, Holmes' guard would start to come down some to protect his body, leaving his chin exposed. Paving the way for Frazier to come under and over with his big left hook. Without the stamina to make Frazier use up half the round to track him down, Holmes would be fighting in spurts. By having to fight inside, Holmes jab and right hand would be taken out it. Leaving him no choice but to trade hooks and uppercuts trying to keep Frazier off, which is Frazier's fight. Although Holmes had a terrific right uppercut, throwing it leaves the right side of his chin open for Frazier's left hook. On top of that, with Joe right on top of him, the punch would be smothered to where he'd never get anything on it. It's no coincidence the closest Muhammad Ali ever came to being stopped in his career were in the 11th and 15th rounds of his first fight with Joe Frazier. In the 11th round Ali was trapped in a corner and forced to trade hooks with Frazier attempting to get out. Which left him open, and Frazier ripped him with a double left hook to the body and followed that up with one to the head, buckling his legs, having him on the verge of going down. In the 15th round with Frazier bearing down on him, Ali rushed a lead left hook followed by a right uppercut trying to keep Frazier off him. Throwing the punch left his chin completely open and Frazier came over the top with a massive left hook that dropped Ali like his legs were cut out from underneath him. Had they fought, Frazier would've forced Holmes to throw uppercuts and hooks like he did Ali, leaving him open for the left hook. The only way Holmes could've kept from trading with Frazier inside is, if he could do what no other fighter not named Foreman could, keep him from getting there. Like Ali, Holmes didn't have a big enough punch in his arsenal to do that. Styles make fights. If there is one fighter with the right style to beat Larry Holmes, it's Joe Frazier. 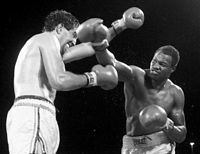 Larry's left jab was one of the most effective punches we've seen in the heavyweight division. But one must understand the style mesh between these two. Frazier would've forced Holmes back faster than he wanted to go back. Making him rush his jab and right hand, throwing them more with the intent to keep Joe occupied and off of him, instead of to score or do damage. With Holmes being forced to rush his punches, his chances of stopping Frazier are slim. Frazier had a terrific chin. Only George Foreman really hurt him and stopped him. Maybe Holmes shakes him early, but he didn't have the power to stop Frazier. Frazier's body attack would drain Holmes energy and power, and it wouldn't be something he could shake. Holmes would've found out fighting Frazier just how big the difference is moving back on your own, instead of moving back because you're forced to. Comparing the boxing/fighting style of Larry Holmes and Muhammad Ali has been done numerous times since Holmes became a ranked contender. The question here isn't who would've won between them; it's which one had more of what's needed as a fighter to beat Joe Frazier? Although their styles were similar, they weren't clones. Neither liked fighting inside, but when forced to, Holmes relied on his right uppercut and Ali leaned more on his left-hook. Holmes would sometimes try to fight his way out if cornered or forced to the ropes, Ali was prone to hold or flurry in spots to escape. 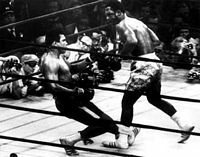 Holmes was susceptible to being nailed with a right hand; Ali was vulnerable to a left-hook. As stated earlier, if Holmes couldn't keep Frazier from getting inside, he's just as vulnerable to Joe's left hook as Ali. Their left jab was their best punch. The post exile version of Ali's was faster, if only by a morsel, and he threw more. Holmes jab was harder and straighter. That said Ali's had more variation. He could change it's direction up or down after he released it, something that makes his jab more effective versus a moving target like Frazier. Holmes is thought to have had the harder right hand, but it's close. As to who was the better puncher, they're in the same class. Holmes may be a couple seats closer to the front of it than Ali, but it's the same class. To state it any other way is wrong. Both were significantly stronger than they ever get credit for being. When it comes to strength that's applicable to fighting in the ring, Ali had a slight advantage. I'm not saying he'd beat Holmes if they arm wrestled, but when it came to tying up another fighter or holding him and pushing him off, Ali was one of the best. Once he put his hands on his opponent, he made them cease what they were doing. It's hard to say with impunity who had the greater stamina. Both always had a third and fourth wind when they needed it. The difference being Holmes stayed in better shape than the post-exile Ali when they weren't fighting. Close, but Ali sucked it up more in 15 round fights than did Holmes, slight advantage to Ali. Having a dependable chin as a last line of defense is a must when taking on Joe Frazier. Holmes took a great punch. How many heavyweights get up from the right hand Earnie Shavers dropped him with in the seventh round of their title bout? If there ever was a punch that rivaled the right Shavers dropped Holmes with, it's the left-hook Frazier dropped Ali with in the 15th round of their first fight, and a more tired Ali got up from the grave before taking a count. The biggest difference in their ability to take a punch as I see it is Ali showed he not only could take one hellacious bomb, but he could take them in succession over the course of a round. If forced to pick who took the better punch, it's Ali. However, it might be better said between these two, "if any fighter had a more proven chin than Holmes, it was Ali." Ali was more versatile on his legs. He could fight on his toes circling right or left and change direction better than Holmes could. Despite this, his legs only carried him out of harms way in 10 of the 41 rounds he fought against Frazier. The bottom line here is neither could've kept Frazier off fighting on their toes. Holmes clearly had the better basics and was fundamentally a better boxer than Ali. He also punched to the body, Ali seldom did. Even so, Holmes body punching would've been nullified by Joe's build and style of coming in low. And if there's anything that can break down a fighter’s fundamentals, it's constant pressure. One of Ali's most effective punches against Frazier was the right lead. A punch Holmes threw as often as Ali went to the body. Throwing it, especially at a moving target leaves the fighter open. But Ali's quick hands allowed him to get away with it. Landing the punch bought Ali extra time and briefly disrupted Frazier's rhythm. In an accumulation of small advantages, I believe Muhammad Ali has a marginal advantage over Larry Holmes fighting Joe Frazier. In the ring as a fighter, Frazier did everything in the book to make Holmes life as Ali said, "the closest thing to dyin." There's no hypothetical regarding whether Frazier could've handled Holmes' style, it's an open book. He showed against every mover/boxer he fought, speed and movement weren't an obstacle for him. He also showed that he could get inside a fast left jab and nullify it to a degree. I know Buster Mathis and Jimmy Ellis weren't Larry Holmes, but Ali was and as stated above, matches up better against Frazier. No fighter was tougher and knew how to fight Ali better than Frazier did. There are three fights and 41 rounds of documented boxing history as undeniable proof. It's no secret to any boxing observer that Holmes never faced a fighter with Frazier's style, let alone stamina, aggression and determination. The unanswered questions only pertain to one fighter in this one, Larry Holmes. When matching two all-time greats from different eras, the fairest way to do it is to match them at their best. The best Joe Frazier was the one who defeated Muhammad Ali on March 8th 1971; the best Larry Holmes beat Gerry Cooney on June 11th 1982. Had they fought, Holmes would've looked terrific winning the first two rounds, possibly shaking Frazier once or twice during them. He also would've expended more energy in those two rounds than any other two he ever fought. Somewhere before the end of the third round, Frazier's pressure would start getting to Holmes allowing him to get inside. By the midpoint of a 15-round fight, Holmes would be reduced to a walk, fighting in spurts. As the rounds progressed his jab will be less frequent and will have lost some sting. He'd really have to load up on the right to keep Frazier from walking through it, which would've taken a lot out of him. After 10 rounds Frazier would be in control, with Larry trying to survive more than fighting to win. While Holmes is fighting to last, Frazier would be on top of him like no fighter he ever fought, looking to end it with every punch. In a great fight, Holmes would've had his moments, but that wouldn't have been enough. Sometime after the 11th round, Frazier would've dropped a tired and spent Holmes who had nothing left to keep him off. Larry would've definitely got up and beat the count, but Frazier would be all over him forcing the referee to stop it before Holmes went down again. Joe Frazier had the perfect style to beat Larry Holmes, and he had it down pat. That's why Frazier at his best would've defeated Holmes on his best night.